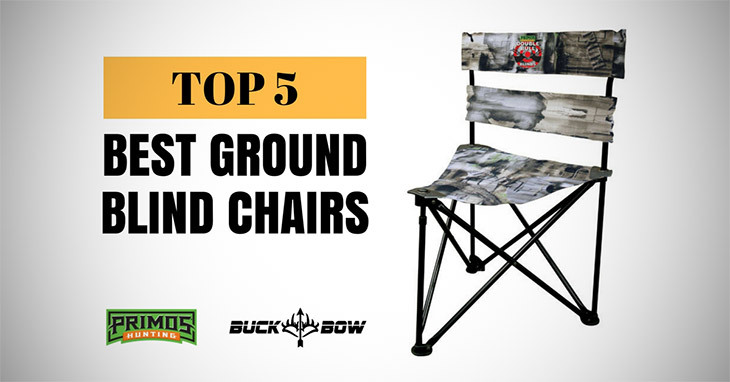 What Is The Best Ground Blind Chair On The Market? Stool. The short stool is possibly the simplest type of chair you can use in your ground blind. It works best on even terrain, since you can simply plop it down near your blind’s wall and sit on it. However, sitting on a short stool for more than an hour isn’t really the best experience for any hunter. Chances are, your legs would likely get cramped and your back will become stiff. Target block. You can also sit on a sturdy target block if you have one at home. What is good about this chair is that you can adjust and turn it around, depending on the height of your blind window. However, target blocks are hard to transport because of their size, so you may need to drive your vehicle somewhere closer if you want to bring in one to your blind. Chair with backrest. A ground blind chair with a backrest is my usual choice because it provides comfort to both my rear and back, especially when I plan to stay in my blind for long hours. It is also easier to transport since most blind chairs can be assembled and dismantled quickly. Just make sure you choose a chair that is durable and can be adjusted to adapt to your choice of terrain. While the Millennium Treestands G100 Blind Chair may be one of the more expensive blind chairs out there, I dare say that it is also one of the more comfortable ones. Made of an exclusive comfortMAX contoured seat, this chair allows you to sit on it for long hours while providing good back support. I love how well this chair is constructed and how it is made of light aluminum so it’s very easy to carry around. I find that it is also very easy to set up and disassemble, and I think it’s great that it produces no sound when you sit on it or when you shift your weight, so you don’t accidentally alert your game of your position. 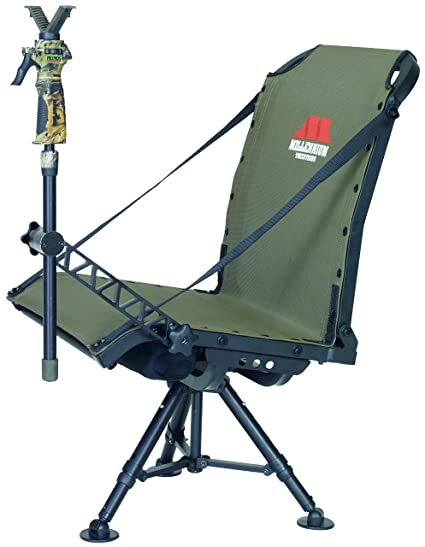 If you’re willing to invest in a sturdy, comfortable blind chair that will last for a long time, then I highly recommend checking out this Millennium Outdoors product. 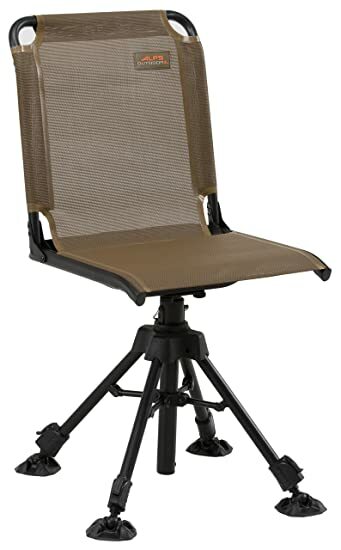 At the other end of the price spectrum is this inexpensive blind chair from Guide Gear, the Guide Gear Swivel Hunting Chair. If you’re not planning to sit on your chair for long hours and are looking to save money, then you may want to buy this model instead. For a very small investment, you can get this chair that can swivel quietly and easily, depending on the angle you need. While it is indeed heavier than other blind chairs, I think it is okay for the price you’re paying for it. Bottom seat is comfortable enough for 3 to 4 hours of sitting time, but I recommend that you add some cushion to the backrest because its padding is a bit thin. You may also want to replace the carrying strap if you want to be more comfortable when transporting this chair from your vehicle to your blind. 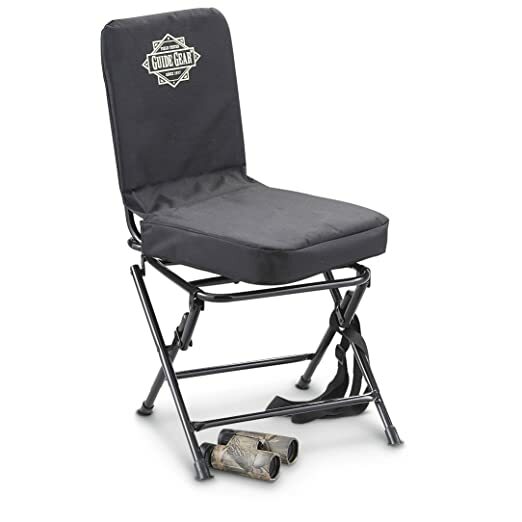 If you want a sturdy blind chair that you can easily adjust depending on your blind’s measurements, then I think you will love the ALPS OutdoorZ Stealth Hunter Blind Chair. If features legs that can be independently adjusted, depending on how even or uneven your terrain is. It also has large swivel feet to help with your overall balance. This model is made of Techmesh materials that are breathable and easy to clean, so you don’t spend a lot of time washing and drying it. It is also durable and comfortable to sit on, so you don’t have to worry about sitting on it for long hours. This ALPS OutdoorZ product is a bit heavy though and not designed for easy transport. I have to partially disassemble it whenever I need to move it from one place to another, but this won’t really be much of a problem if you plan on leaving it in your blind for the entire hunting season anyway. 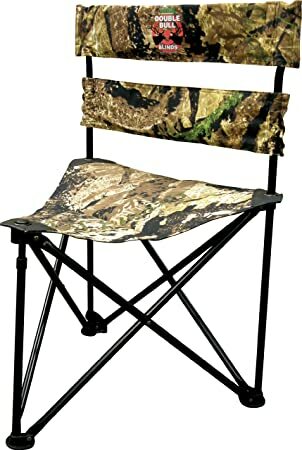 The Redneck Outdoors Portable Hunting Chair may not be lightest blind chair in this list, but I think it is one of the most durable ones. Made from heavy-duty steel, this chair is designed to be sturdy and to carry loads of up to 350 pounds. This model’s legs can be adjusted independently so it’s easy to set it on uneven surfaces, and you can use its lock pin to keep the seat and legs in place. The seat swivels silently but can only turn up to 180 degrees. My main issue with this product is that because it is made of steel, it is rather heavy and not designed for regular transport. The carrying strap could be made thicker, too, because it’s a bit difficult to carry the chair around without hurting your shoulder. Capping off this list is the Primos Double Bull Tri Stool, a cheap but sturdy blind chair with a triangular seat for easier movements. However, unlike other chairs, this model does not swivel, so you have to manually adjust yourself to make shots from different angles. This Primos product is designed to be easy to assemble and disassemble, and it comes with a handy carrying strap for easier transport. The weight of the chair is also pretty light, so you can easily carry it around on a regular basis. Height. A good blind chair should accommodate all types of users, from those with short legs to those with long, bulky ones. Try to look for a chair with legs that can be adjusted individually, so you can make small changes depending on the terrain you are in. Weight. When choosing a blind chair, make sure you get one that can carry your weight and then some, so you won’t worry about the chair breaking off once you’re sitting on it. On the other hand, the chair shouldn’t be so heavy that you have a hard time transporting it from your vehicle to your ground blind. It may also be a good idea to check on the chair’s strap to see if it distributes the weight evenly once you collapse the chair for transport. Comfort. 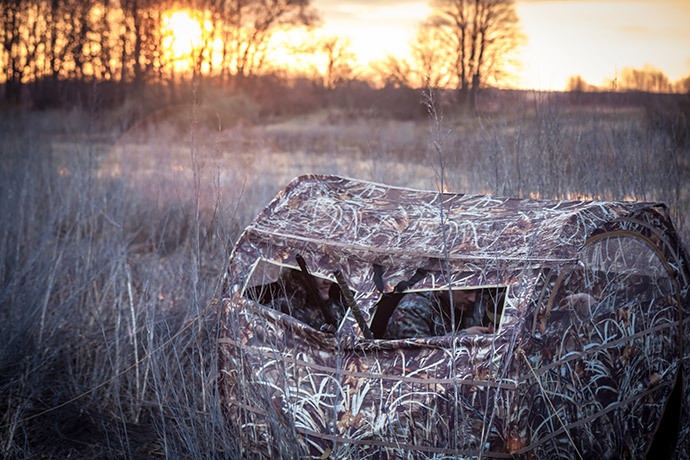 Assume that you will be staying in your blind for long hours as you wait for your game. Your blind chair should therefore be comfortable enough that you can sit on it for a long time without hurting your back or rear. Go for a chair that has good padding and doesn’t dig into your skin when you sit on it. Durability. Because you might be sitting on your chair for the majority of your hunt, it should be sturdy enough to hold down your weight without breaking down. Avoid flimsy-looking chairs that are made of substandard materials, even when they cost less. Sure, it may seem that you’re saving money at first, but you’re actually spending more because you have to replace them often. Stealth and Swivel. You need to remain as quiet as you can in your blind so you don’t scare away your target. This means that your chair should be able to swivel without producing any noise. You may also want to get a chair that can swivel 360 degrees, so you don’t have to worry about changing your sitting position as you adjust your angle, depending on the spot of your game. Ease of Use. A good blind chair should be easy to set up and dismantle. Look for a chair that doesn’t need any complicated setup or a variety of tools for assembly. Ideally, your chair should also be easy to disassemble, so you don’t spend too much time taking it apart at the end of your hunting trip. Price. There are many inexpensive chairs available in the market right now, but don’t just get the cheapest one you can find. Instead, you may want to invest on something that is a bit more expensive but which quality will allow you to use it for a long time. I am a bit partial to the Millennium Treestands G100 Blind Chair because of its light and sturdy design and the fact that it produces no noise as it swivels into position. Not only that, but this model is also very comfortable to sit on, especially for long stakeouts inside your blind. Sure, it’s more expensive than the other chairs in the list, but I find that it’s a good investment that will last for years. If you have a tighter budget, then you may want to check out the ALPS OutdoorZ Stealth Hunter Blind Chair instead. 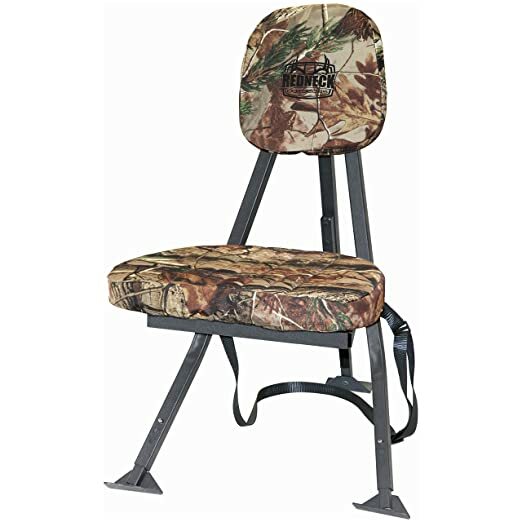 It’s way cheaper than the Millennium Treestand product but also offers a sturdy design, complete with adjustable legs and TechMesh materials that offer better comfort.